At just a few months old, this is the love Wilbur should have known right from the start. Swaddled in a blanket, he makes nary a peep as someone treats what appears to be an injured back paw. There's also a mystery wrapped up in that blanket. How does a pot-bellied pig just appear at the side of a road in Anne Arundel County, Maryland? Stray dogs, sure. But pigs? On Facebook, a video of Wilbur being cared for by animal control staff is fueling "ooohs," "ahhhs" and "uhhh ... whats?" Indeed, it seems like everyone is trying to figure out where this mystery pig came from. Some suggest the little pig is a fugitive from roadside pet vendors known to gather near Maryland Route 178. Others swear they saw him in a Craigslist ad - among thousands of animals who feed a surging market for pint-sized pigs. In any case, there's little doubt this pig of mystery hails from hard times. Rest easy, Wilbur. That road is behind you. 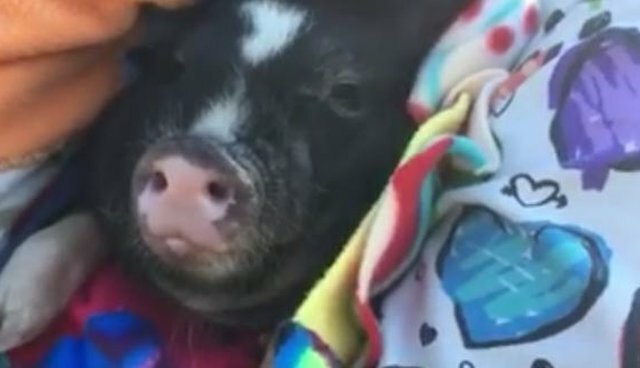 "I think that's the quietest a pig being held has ever been," someone coos in the video. Wilbur is looking for a new home. If you're interested, visit Anne Arundel County Animal Control.